In the name of God, the one who creates. In the name of Christ, the one who redeems. In the name of the holy spirit, the one who guides in truth. In the name of the trinity, the three in one. The Holy Scriptures commend us, as a people of faith, to publish glad tidings that the world may know that things which were cast down are being raised up, and things which had grown old are being made new, and that all things are being brought to their perfection by him through whom all things were made, Jesus Christ. Therefore, we publish this sacred Covenant as a living sign of the renewal of the centuries old relationship between the Indigenous peoples of the Americas and the Anglican Communion. We gather in community, on this feast of All Saints, in the year of our Lord Nineteen Hundred and Ninety Seven, to pray God's blessings on our common mission. We are the Indigenous peoples of this hemisphere. We are Native American and Native Alaskan people. 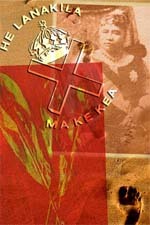 We are Native Hawaiian. We come from many tribes and nations and speak many languages, but this we share in common: we are a free people of a common history bound by a shared tradition who embody a culture both ancient and wise. We are the Episcopal Church. We are a community comprised of many cultures, many races, and many traditions, but this much we share in common: We are equal partners in the mission of Christ as it is proclaimed and lived out by the church we celebrate and serve. Representing these two expressions of our church, we gather to make a Covenant of Faith between the Episcopal Church and its Indigenous peoples. We begin in prayer, asking God to bless and sanctify our pledge of faith as we seek the wisdom and direction of the Holy Spirit in fulfilling its promise. We add our individual names to this Covenant in humility, inviting others to join us in the commitment and hope it embodies for us all. We offer this Covenant to the church, inaugurating a decade of study, action, and prayer as the relationship between us continues to mature and bear the fruit of the gospel. We lift this Covenant up as the sign of a recognition and reconciliation for all Indigenous communities and their neighbors in the Episcopal Church: may a new decade of respect and justice unify us all as we seek to be the family of God. As we strive for justice in reconciling our history of colonialism and the suffering it has engendered for generations between us: We will continue to be as constant in our search for the truth as we are responsive to its discoveries. As we work together to find new solutions to the social and political challenges still before us: We will continue to be as dedicated to the principles of self-determination as we are committed to justice for all humanity. As we expand the theological and spiritual dialogue between our several traditions and communities: We will continue to be as respectful of the integrity of Indigenous traditions as we are loving in sharing Christ. As we stand together to honor, protect, and nurture our home, the earth: We will continue to be as active in stewardship of God's creation as we are diligent in our advocacy for its care. With these four principles as our guide for a Decade of Remembrance, Recognition, and Reconciliation, we, the undersigned, pledge our hearts and minds to the task God has placed before us. We do so not with a pride that assumes we speak for all, but rather with a humility that invites others to join us in living out the gospel. We call upon all people to reflect upon the true meaning of our agreement: that through Jesus Christ those who were once separated by walls of hostility have been brought together: those who were once unequal in power and position now have equal access to the spirit through the church they share: and that together they are no longer strangers and sojourners, but fellow citizens with the saints and members of the household of God. We are the Episcopal Church. We are partners in the future for which God has planned and humanity has dreamed over four hundred years. May God bless this Covenant and may God bless all those who embrace it as their own. To these four statements of a shared faith, in solemn covenant one to another, we commit ourselves before God and in celebration of the mission and witness of the Episcopal Church. In so doing, we honor one another as we begin again the long journey that has brought us this far. With God's help, in the love of Christ, and under the direction of the Holy Spirit: may we journey longer still in friendship and in faith.